Inhabitants of the Central African Republic observe General Prayer Day every year on June 30. This holiday unites all people of CAR regardless their religion and political views. 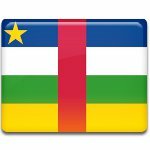 Political climate in Central African Republic is very tense after proclamation of its independence from France in 1960. David Dacko, the first President of independent CAR, was overthrown by Colonel Jean-Bédel Bokassa in 1965. Bokassa became president of CAR, suspended constitution and dissolved the National Assembly. He declared himself President for Life in 1972, and named himself Emperor Bokassa I of the Central African Empire in 1976. Bokassa was overthrown by France, that restored Dacko to power in 1979. His presidency again didn't last long and he was overthrown for the second time in a coup led by General André Kolingba in 1981. A civil war outbroke in CAR in 2004 (known as the Central African Republic Bush War), that ended only in 2007. In 2012 the Central African Conflict started, that lasts to the present-day. General Prayer Day gives people of different political views opportunity to forget about the arguments and pray for their relatives and friends, for mutual understanding and stability in the country, for end of the conflict. A special liturgy is served in churches across the country.